Located just minutes from the international airport and bordering the Nairobi National Game Park, Ole Sereni offers views of animals in their natural surroundings at the waterhole in the park from the restaurants, bar, roof-top swimming pool and other parts of the hotel. Ole Sereni combines the best features of a modern hotel and a traditional wildlife lodge offering world-class facilities and personalized service. 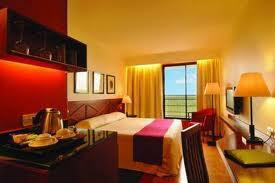 Each of the 134 rooms is exquisitely furnished and air-conditioned. August 20: After a leisurely breakfast, you depart with Patrick in your private Land Cruiser driving to Amboseli National Park and arriving at your camp in time for lunch and an afternoon game drive. 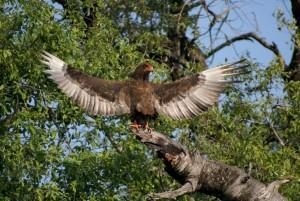 August 21: After an early breakfast, enjoy a full day’s game drive with picnic lunch or return to camp for lunch. You arrive back at your camp in time to relax a bit before dinner. Enjoy a sundowner high on a hill while watching the sunset over Mt. Kilimanjaro. 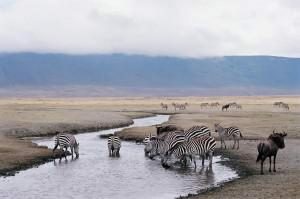 At the foot of Mount Kilimanjaro, Africa’s highest mountain, Amboseli is one of the most popular of Kenya’s national parks. The snow-capped peak of Kilimanjaro, rising above a saucer of clouds, dominates every aspect of Amboseli. Despite its small size and its fragile ecosystem, Amboseli supports a wide range of mammals (well over 50 of the larger species), birds (over 400 species), and gigantic herds of elephants. Years ago this was the locale around which Ernest Hemingway spun his stories of big-game hunting in the wilds of Africa. August 22: After breakfast you drive to the Tanzania border where you clear immigration, get your visa ($100), and transfer to your Tanzanian driver and private Land Cruiser before continuing on to Tarangiri National Park arriving in time for lunch and an afternoon game drive. 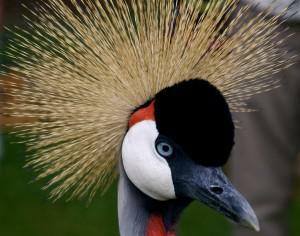 August 23: A full day of game drives and cultural experiences to be arranged with your private driver. 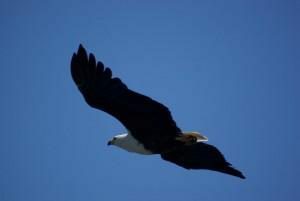 August 24: Another full day of game viewing activities. 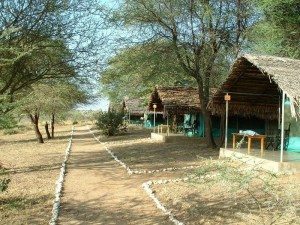 Tarangiri Safari Lodge offers 35 spacious tents each built on a solid base with a thatched roof, screened windows, and small personal veranda. The ensuite, stonewalled bathroom includes a solar-heated shower with ample hot water, flush toilet, and a dressing room with a wash basin, mirror, clothes rack and laundry basket. The bungalows are built from local stone with thick walls, large windows and a thatched roof to insure that they remain cool even in the heat of the day. After a long day’s game drive you can relax by the pool, browse for souvenirs in the gift shop, share safari stories in the lounge and bar, or email home using wireless Internet service. Even though located in a semi-desert region, Tarangiri always has water. Because of this it has the greatest concentration of wildlife outside the Serengeti ecosystem – a smorgasbord for predators. 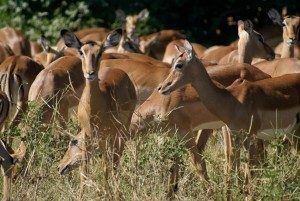 It is not uncommon to see herds of up to 300 elephants scratch the dry river bed for underground streams, while migratory wildebeest, zebra, buffalo, impala, gazelle, hartebeest and eland crowd the shrinking lagoons. In addition to large game, the swamps lure 550 varieties of birds. Keep your eyes on the trees in Tarangiri – you might see pythons, lions, or leopards. August 25: Depart with your private driver for Ngorongoro National Park. 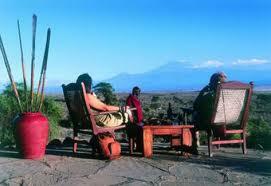 You drive through Olduvai Gorge and arrive in time for an afternoon game drive before dinner at the lodge. 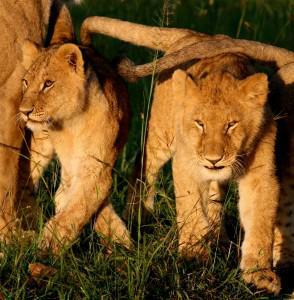 August 26: Today you descend into the Crater for a full-day game drive. There are some opportunities for wonderful photographs with the Crater wall as a backdrop. Share your experiences with other guests over dinner and drinks. Hugging the contours of the jagged Crater rim, the lodge takes its inspiration from the so-called ‘Cradle of Mankind’, the prehistoric site of Olduvai Gorge. Linked by arched stone passages and timbered decks, the walls are decorated with stylized prehistoric cave paintings and lit by flaring torches. 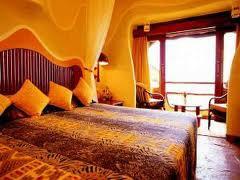 Each room has its own rock-enclosed balcony with uninterrupted views of the volcanic amphitheater far below. 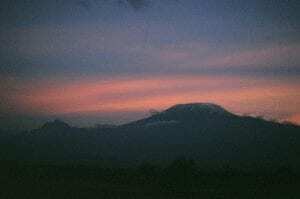 The Ngorongoro volcano, before it exploded and collapsed 2 million years ago, was one of the world’s tallest mountains. Today it is the largest unbroken caldera in the world, presenting a microcosm of east African scenery and game. The crater – ringed by steep, 2,000 foot walls – shelters forests, grasslands, fresh springs, and a large soda lake at its center. 30,000 animals, including Tanzania’s few remaining black rhino that are protected and regularly sighted, inhabit the crater floor. 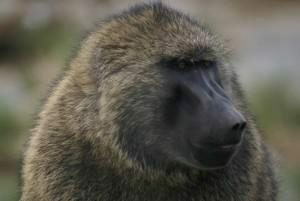 It is also common to see black-maned lions, other big cats, more than 100 bird species, elephants, and many species of antelope. There are spectacular photographic opportunities due to the backdrop of the crater walls. August 27: Today you drive to the Serengeti enjoying a picnic lunch on the way. There is game viewing during the entire drive. After checking into the lodge, there is time for a late afternoon game drive before dinner. 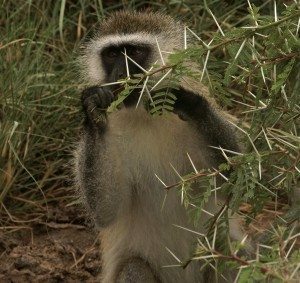 August 28: A full day game drive with a picnic lunch allows you to explore and photograph a large area of the Serengeti. Keep an eye out for the tree-climbing lions. 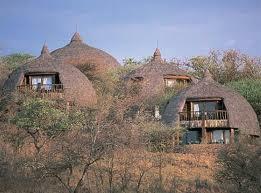 Serengeti Serena Safari Lodge sits high on a tree-clad ridge and offers magnificent views of the Serengeti plains. Its architecture, influenced by the circular “Rondavel” dwellings and winding paths of a traditional Masai village, features thickly-thatched, stone-built rooms, spaciously set amongst groves of indigenous trees that are cooled by sparkling streams and papyrus-fringed ponds. You can swim in the “vanishing horizon” pool while watching the animals on the savanna below. The Serengeti, one of the oldest ecosystems on earth, has come to symbolize paradise. In over a million years, from the time early humans first appeared there in the Olduvai Gorge, the climate and vegetation have barely changed. 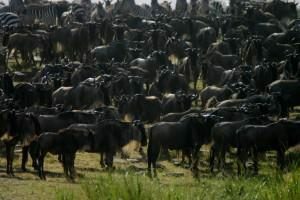 The Serengeti’s fame today derives mostly from the famous wildebeest migration, when over a million wildebeest and 200,000 zebras migrate between the Serengeti and Masai Mara, following the freshly grown grass. They typically travel south from the northern hills to the southern plains for the short rains (October and November) and head west and north after the long rains (April to June). 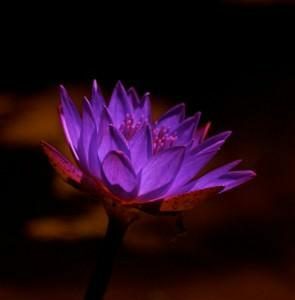 August 29: This morning you say goodbye to your driver at the border and go through immigration. 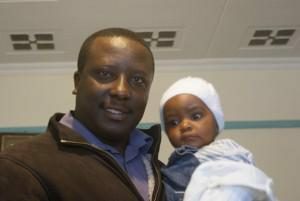 If you need another Kenya visa, it is easily obtained at the border. There are always photo opportunities as locals and tourists alike use this border crossing. Patrick meets you at the border to continue on to the Masai Mara, arriving in time for lunch and an afternoon game drive. After entering the Mara, it is a game drive on the way to the Camp. 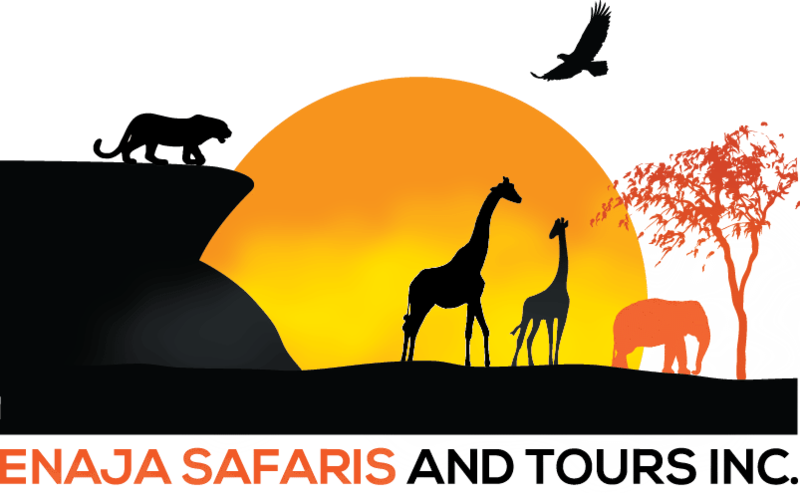 August 30: Dawn and late afternoon or all-day private game drives. 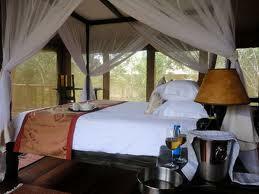 Watch for game at the Mara River from your room and the public areas of the Camp. August 31: Another full day of game-viewing and cultural experiences to be arranged with Patrick. Ashnil Mara Camp is comprised of 30 luxury tents located within the Maasai Mara National Reserve adjacent to the Mara River famous for the wildebeest migration. Each of the luxury tents includes ensuite bathrooms, walk-in closets, and a sun deck for relaxation while watching game. Try surprising international cuisines from the restaurant’s set buffets and/or a sundowner cocktail in the open-air bar. If you want to contact the folks at home, Internet service is available at reception. Some of the optional activities available are guided nature walks, in-house cultural activities, sundowners, bush dinners, and you can even get a massage. September 1: After a leisurely breakfast, or with a picnic breakfast, you watch for game (maybe even a crossing) as you drive across the Mara to the Serena Lodge. You are actually on a game drive the entire drive. This afternoon is free for another game drive or taking advantage of optional Lodge activities. The staff is always alert to any “migration crossing” activity and reacts accordingly. Hopefully you are able to get that special full-moon photograph. September 3: A day free for game drive and more photography. As always, you arrange with Patrick when and where you want to go. 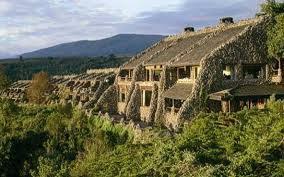 Nestled deep within the Masai Mara National Reserve, the Mara Serena Safari Lodge is the ultimate safari destination. Set high on a bush-cloaked hill, embraced by arcing vistas and washed by a sea of richly rolling grasslands, it stands center-stage to one of Africa’s most dramatic wildlife arenas and has a ringside seat for the greatest wildlife show on Earth, the legendary migration of the wildebeest. Drawing its inspiration from the traditional Masai cultural motif of a cluster of domed, mud-colored huts encircled by a “Boma” of brushwood, the Mara Serena offers a rare blend of raw African splendor and sumptuous sophistication. The essentially ethnic decor also draws on a vibrant color-palette of sunburst colors, embellished by a unique selection of Masai art to create the look and feel of a traditional bush encampment. The lodge features individual rooms, each with their own balcony and view of eternity, a sky-blue swimming pool and a spectacular restaurant overlooking a water hole where creatures collect to drink. 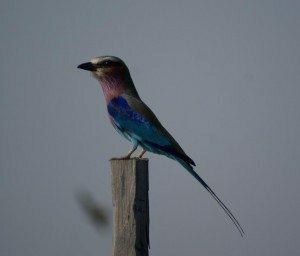 September 4: After breakfast, you depart for Lake Nakuru and enjoy a game drive and bird watching on the way to the Camp. After lunch there is another game drive in the Park. September 5: Again today, you arrange with Patrick whether you want a full-day game drive or to return to the Camp for lunch. Expect to get rhino photographs here. Situated in the heart of Kenya’s Rift Valley, Sarova Lion Hill Lodge is nestled on the banks of one of east Africa’s most famous soda lakes, Lake Nakuru. 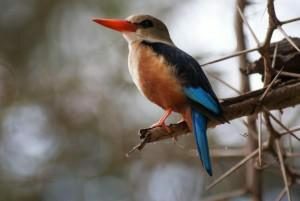 Two major features of this park are the bird life (particularly the thousands of flamingos that create a shimmering pink hue over the lake) and the rhino sanctuary that provides the opportunity to see the endangered black rhino. All bedrooms are chalets with private bath and a veranda with panoramic views of the flamingo pink-rimmed lake. 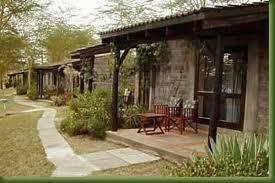 Other facilities include a restaurant, bar with a large viewing deck overlooking Lake Nakuru and the distant hills, a swimming pool, sauna, laundry service, and gift shop. The size of the alkaline Lake Nakuru fluctuates with the seasons, but its international fame comes from its having the largest flamingo concentration in the world. Lake Nakuru National Park should not be regarded only as a flamingo sanctuary, however, because the Park is also an outstanding place for watching a variety of other birds, including other brackish water species and birds of prey. Herds of waterbuck, gazelle, impala, and reedbuck graze in the surrounding acacia woods and grasslands of Lake Nakuru National Park. 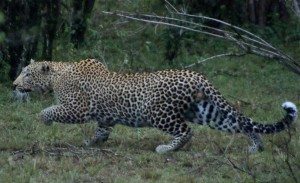 This park is an important sanctuary for both Black and White Rhino, often seen resting under acacias by the shore, and the park offers one of the best chances in Kenya of seeing a leopard. After a morning drive, you continue on to Lake Naivasha, arriving in time for lunch. Depending on your arrival time in Naivasha, you might want to have lunch at Delemere Nyama Choma to try a truly local spot. Patrick can advise about this. 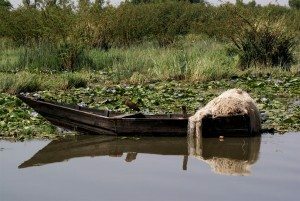 This afternoon take a boat ride around the Lake watching for birds, hippos, and other game on your way to Crescent Island. 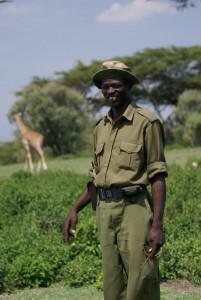 The Island’s private guide accompanies you on a leisurely game walk. When you are ready to leave, Patrick is waiting to drive you back to the Lodge. From your room this evening, watch for game grazing on the lawn. 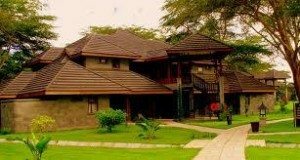 The green lawns of the Simba Lodge, shaded by acacias and spreading fever trees, stretch down to Lake Naivasha. Each of the Lodge’s 70 rooms has a private balcony from which to watch game. After a day’s activities, relax in the heated swimming pool, take a nature walk along the lakeshore, or visit the health center that provides the latest gym equipment, massage, sauna and steam baths. After breakfast, depart for Nairobi where you visit the Karen Blixen House Museum, have lunch at the Tamambo Coffee Garden, and visit Kazuri Beads and Matt Bronze. 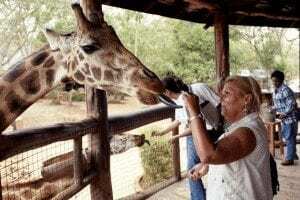 If you are interested, there may be time to visit Giraffe Center and do some last-minute shopping before going to the hotel. After refreshing a bit at the hotel, dinner is at either the nearby Pampas Churrascaria or at Ole Sereni. This museum was originally the home of Karen Blixen, who came to Kenya from Denmark in the early part of the 20th century. The present museum sits at the heart of the larger coffee plantation run by Blixen between 1914 and 1931. Upon Kenya’s independence, the Danish government donated the house and surrounding land to Kenya. The house was restored by the Danish government and was used during the filming of Out of Africa. Much of the original furniture is on display in the house, and combined with the beautifully landscaped gardens and encompassing view of the Ngong Hills, the Museum has continued to be a very popular destination for international and local visitors. Pampa Churrascaria, an Authentic Brazilian Rotisserie, is a haven for meat lovers and vegetarians alike offering an exquisite dining experience in an ambience that is welcoming and captivating. The menu embraces a variety of different cuts of beef, chicken, goat, lamb, pork, fish, turkey; exotic meats such as crocodile, camel, guinea fowl and ostrich. In addition you can choose from more than 16 different kinds of salads, hot and cold vegetables, and other hot dishes at the salad bar. You might want to try the Caipirinha, a popular Brazilian cocktail made with a sugar cane spirit. An early morning transfer to the airport for your flight.